So, I don't really have any WIPs going right now. I seem to be in a rut, and I can't find anything inspiring to pull me out of it. 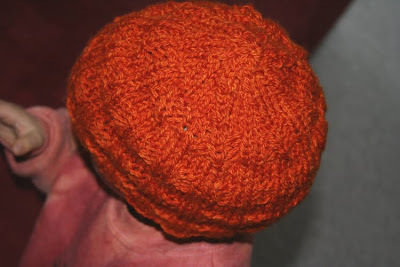 I haven't knitted a stitch in 3 days! I think that's a record since I learned to knit back in February! I'm sure this chilly, rainy weather we're having will have me knitting again in no time, but until then, here are some handknits that have made their way into our lives over the last week. 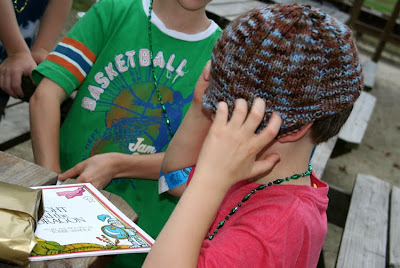 At Philip's birthday party, he received the hat I made for him earlier this summer. I don't know what it is about Paulie and Philip pulling their hats way down over their eyes. Apparently, that's how the kids are wearing them these days. He was excited about his birthday hat since Paul just received one for his birthday as well. The camouflage hat for Philip's Christmas stocking that I began last week is finished now. Elizabeth was my model since we're keeping it a surprise. 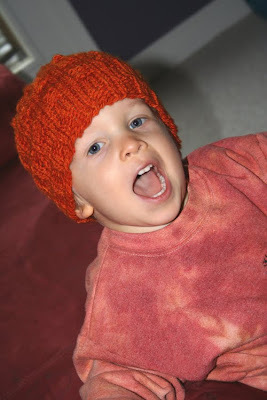 Finn was thrilled to get his orange hat, knit from the wool he picked out at the sheep farm the other week. Another shot I happened to catch earlier this week: Elizabeth thinks my shawl looks like "something a grandma would wear"! She was even so kind to demonstrate for me, complete with playsilk headscarf and a marshmallow launcher cane. 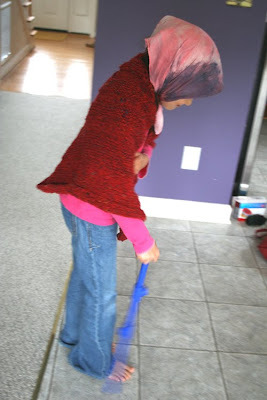 So, apparently, I'm an old, shawl-wearing lady now. Sigh. I'm going to give knitting another try this year. Your hats sure are nice looking. Yay! Hats, hats and more hats!! Thank you again for your help with my Soulemama hat. Amanda Ssoule actually responded onmy thread in the Inspired by Soulemama group on Ravelry. I was glad to see I wasn't the only one who couldn't follow it, tee hee. lol, I love the picture of Elizabeth in the shawl. I love all of the hats, beautiful work. I think I'm going to have to pick up some of that camo yarn. Those hats are fabulous! If I knew how to knit, I would makes loads and loads of funky, loud socks! 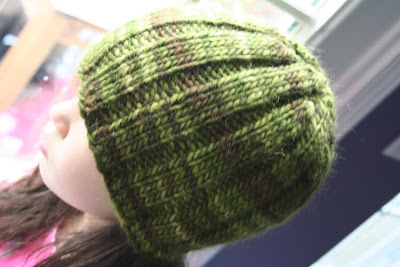 love your hats, all in fall colors. HA! The cutie Elizabeth with her "old lady" look! I can't believe you've only been knitting since Feb. You may be in a rut, but what you have done so far is amazing!